Because of its oil content, sesame is often processed to a high-quality oil. Roasted and pressed it can be used as spice, and complete sesame seeds are perfectly suitable to refine dishes, baked goods and muesli. Sesame is part of the genus Sesamum, originally from India and parts of Africa. Today, the plants, which grow up to 1.20 m high, can be found in many tropical and subtropical regions of the world. For a long time sesame, with white or pink blossoms and longish-square capsules, has been known for the seeds they contain. These seeds are black, brown or white and contain valuable oils, unsaturated fatty acids and proteins. 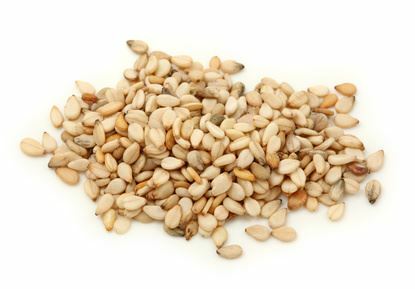 In addition, sesame contains large quantities of magnesium, calcium, phosphorus and the vitamins E and B-group. Furthermore, sesame has one of the highest selenium contents of all foodstuff.